Trojan J205G Floor Machine Battery, Free Delivery to many locations in the Northeast. Trojan J205G Deep Cycle Battery, Free Delivery to many locations in the Northeast. 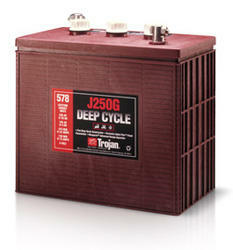 Trojan J250G Deep Cycle Battery, Free Delivery to many locations in the Northeast. Call 951-652-6051or Email us usabatterysales.com@gmail.com with your location before ordering to see if you qualify for our free delivery offer. The Trojan J250G batteries are sold with core exchanged at the time of the delivery. If you don't have a core the core charge is $36.00 per battery. Length 11 11/16" Width 7" Height 11 1/2"
Trojan's proprietary Maxguard® Advanced Design Separator and exclusive Alpha Plus® paste formulation team up to increase battery life, extend run time and decrease maintenance. Polyon?container - the ultra-rugged case design stands up to the harshest of environments. Price is with a like core exchanged at the time of the delivery. If you do not have a battery of the same group size to exchange you will need to add one core charge per battery purchased. Batteries may only be delivered to a commercial address. for free delivery to your location. SOME BATTERIES ARE NOT STOCK AT EVERY WAREHOUSE LOCATION. PRIOR TO PLACING YOUR ORDER SO WE CAN MAKE SURE THE BATTERY YOU ARE ORDERING IS IN STOCK AT THE NEAREST WAREHOUSE TO YOUR LOCATION. THIS WILL INSURE PROMPT DELIVERY TO YOUR LOCATION. Truck, Golf Car, RV's. Marine , Solar & Wind Energy Storage. f. Height is measured from the bottom of the battery to the top of the terminal. Heights may vary according to type of terminals specified. g. Capacity @ 56 amps is 90 minutes. h. Capacity @ 56 amps is 117 minutes. i. Capacity @ 56 amps is 132 minutes.